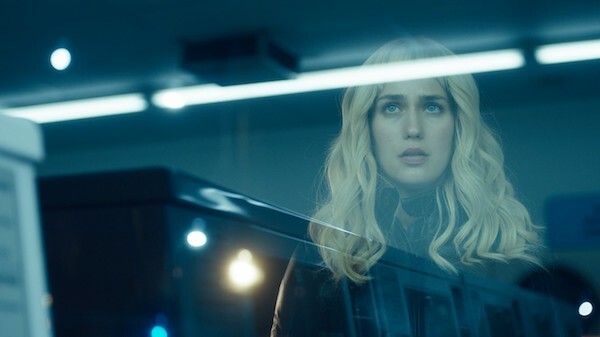 Set in a celebrity obsessed Los Angeles, Gemini (2017) is an atmospheric noir thriller from screenwriter and director Aaron Katz. True to the noir genre, there’s duplicity, murder and mistaken identity as a protagonist gets in over her head. 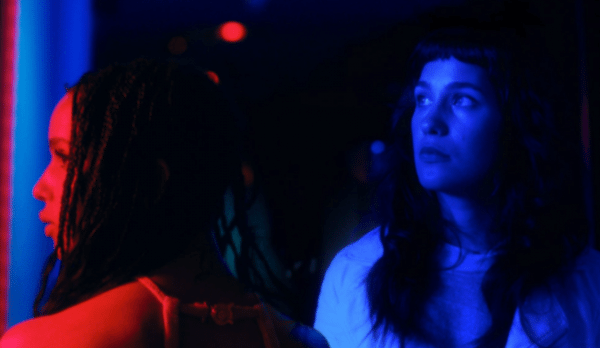 Jill (Lola Kirke) is an assistant to pop star Heather (Zoe Kravitz). Jill’s duties include managing Heather’s schedule, fielding calls, shielding her from the paparazzi and keeping obsessed fans at bay. In some ways Heather’s servant, Jill has to also be her best friend. After a moody low angle shot of palm trees at twilight, we enter the world of young Hollywood. The glory days of the big studios are long gone, but there’s still wealth, privilege and a sense of entitlement. An invisible wall keeps the wannabes out. For added protection, Heather stashes a loaded 22 caliber pistol in the luxurious hillside home she once shared with her boyfriend. Heather has decided to drop out of a big movie role. She’s rethinking her career at an inopportune moment. At least figuratively, the director (Nelson Franklin) could murder her. Heather’s agent (Michelle Forbes) is also livid. Jill acts as an intermediary between the warring factions. There’s also Heather’s ex, Devin (Reeve Carney), to contend with as well as the new love of Heather’s life, Tracy (Greta Lee). When a real murder happens, Jill becomes a suspect. Jill is questioned by Detective Edward Ahn (John Cho) who’s assigned to the case. The detective is a younger, Asian version of television’s Columbo. Like the Peter Falk character, he lurks about in a rain coat in usually sunny Los Angeles turning up in odd places. He senses that Jill, who was the last person to see the victim alive, is concealing something but doesn’t know what. Since the case involves a celebrity, the detective treads lightly and doesn’t move to put Jill under arrest, immediately. She dons an unconvincing blonde wig and starts her own investigation. Cho gave two of his best performances this year, in Gemini and in Columbus which also showcases modern architecture. And so the tone shifts ever so gracefully from a “Mulholland Drive”-style study of these two Tinseltown doubles to a more “Night Moves”-like genre-movie homage. Absorbing much of its production value from a series of stunning architectural locations — a mix of old Hollywood and newer, more modern structures — and carefully art directed in cool blues and golds, “Gemini” defies the sunny, almost tropical feel of so many Los Angeles movies. From its opening palm-tree-lined drive, Katz succeeds in turning the iconic city upside-down and inside-out. Playing with mirrors and sleek geometric patterns, DP Andrew Reed’s style has an almost European feel, alternating between meticulously choreographed Steadicam shots and chilly arm’s-length compositions (including a motorcycle chase framed from an impossibly far remove). 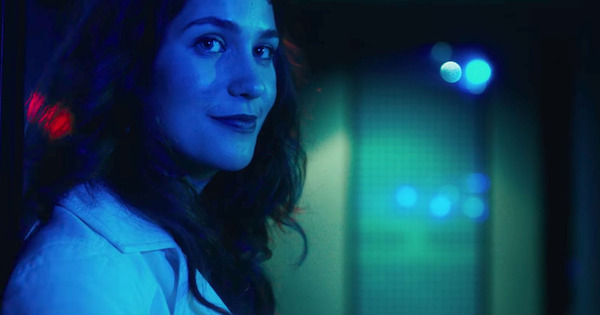 Meanwhile, channeling the vibe of movies he discovered on VHS, complete with their neon-lit “Miami Vice”-like visuals and synthesizer-driven jazz scores, Katz shadows Jill as she pursues her own investigation, both to clear her name and to uncover the killer. I would guess Barbet Schroeder’s Single White Female (1982) with its mismatched twins was also on that viewing list. Researching a sci-fi film, he started looking at the symbiotic relationship between pop stars and their personal assistants. 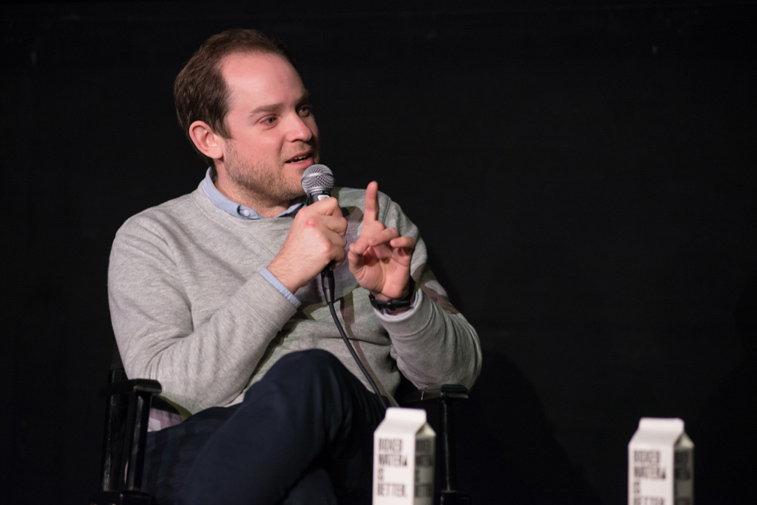 “It’s professional but it’s very personal and where that line is, is very blurry.” He ultimately used those threads and wrote the film with Lola Kirke in mind. They’d never met but he’d seen her in Mistress America (2015) and could envision her as Jill. Talking about the casting process in general, he said that he “wanted each part to feel lived in. I love watching movies where parts that are only onscreen for three or four minutes are really memorable. 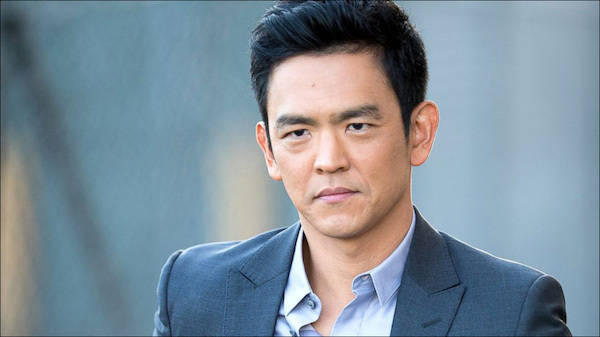 Cinematographer Reed suggested John Cho for the detective. 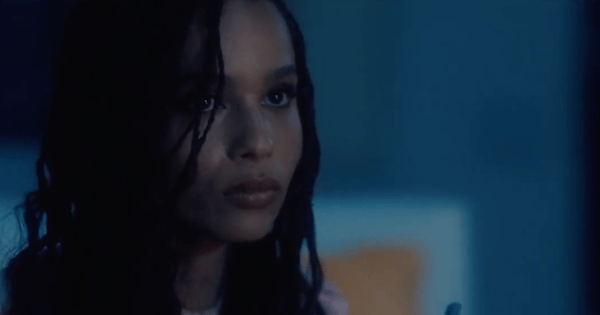 This entry was posted in Events, Movies and tagged 2017 AFI Fest, 80s thrillers, Aaron Katz, American Independents, Andrew Reed, Curtis Hanson, Gemini, John Cho, Lola Kirke, VHS, Zoe Kravitz by crimsonkay. Bookmark the permalink.